Robert Matthew Hurley was born on the 28th June 1971 in Jersey City, New Jersey USA, and is best known for being a former professional basketball player, who played in the position of point guard in the National Basketball Association (NBA) for the Sacramento Kings team. Currently, he is best known for being the head coach of the University Of Buffalo and the Arizona State basketball team. His basketball career has been active since 1993. Have you ever wondered how rich is Bobby Hurley? According to authoritative sources, it is estimated that Bobby’s net worth is over $8 million as of early 2016, with the main source of this amount of money being, of course, his career as a professional player and coach. Another source is coming from his owning of thoroughbred horses. Bobby Hurley started playing basketball when he was going to St. Anthony High School, where his father Bob Hurley, Sr. was the head coach. While at high school, thanks to his skills, Bobby excelled as a basketball player, and he won four Parochial B state titles with the team. In his senior year, the school was listed No. 1 in the USA, as they won the school’s first Tournament of Champions crown. He finished his high school career with a win-loss record of 115-5, and he managed to win McDonald’s All-American MVP. Right after high school, he became a student at Duke University, where he played for college team, and thanks to his accomplishments, Bobby was named the NCAA Final Four Most Outstanding Player in 1992, while winning the national championship in 1991 and ’92. Bobby’s professional basketball career began in 1993, when he was selected by the Sacramento Kings as the 7th pick overall in the NBA Draft. He stayed with the Kings until 1998, after a number of turbulent seasons. His rookie season was a disaster, as he fought for his life, after a terrible car accident, and he spent the majority of his rookie season in hospital. After recovering from his injuries, Bobby returned to the NBA and played for the Kings four more years. Before he decided to retire, Bobby played one season for the Vancouver Grizzlies, which increased his net worth a little bit more. However, after retirement from playing, Booby decided to start a career as the owner and breeder of thoroughbred horses. Currently he owns Devil Eleven Stables, which operates with success, increasing Bobby’s net worth by a large margin, after each win of their horses. Bobby subsequently returned to basketball as a coach in 2010, when he was appointed as an assistant coach for the Wagner College men’s basketball team, with his brother Dan as head coach. He began slowly to build his coaching career, and in 2012, he became associate Head Coach of the Rhode Island basketball team. In 2013, Bobby served as the head coach of the University Of Buffalo basketball team, and led them to their first NCAA Division I tournament appearance, and most recently, Bobby has been appointed as the head coach of the Arizona State University Sun Devils, which has only added to his overall net worth. 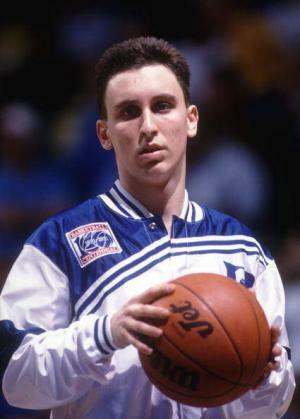 When it comes to his personal life, Bobby Hurley has been married to Leslie since 1995, with whom he has three children. His spare time he spends with his family, and is also active on Twitter, on which he has over 35,000 followers. 2 Plunged into horse racing after he was introduced to it by a friend in Jersey City. He pored over books, studied bloodlines and became an obsessive watcher of videotapes. 3 He named one of his daughters Cameron after Duke University's famed Cameron Stadium. 4 He officially retired from the NBA in 1999. 5 He was traded from the Sacramento Kings to the Vancouver Grizzlies in 1998. 6 Returned to the basketball court on October 14, 1994 for a preseason game against the Los Angeles Lakers. He went on to play 68 games for the Kings after returning from injuries. 7 December 12, 1993: Hurley's truck was struck by another car at a deserted intersection. His injuries were critical: two collapsed lungs, windpipe ripped from his lungs, a broken shoulder blade, five fractured ribs, a torn ligament in his right knee, a fractured lower back, a broken leg, and a sprained wrist. Not to mention numerous cuts and bruises. 8 Selected by Sacramento Kings in the first round (seventh pick overall) in the 1993 NBA draft. 9 1992: USA Basketball Developmental Team 1992-1993: First Team All-America and ACC First Team Graduated from Duke in the Spring of 1993 with a degree in Sociology. 10 1991 USA Basketball World University Games Team 1991-1992: Third team All-America, All-NCAA Tournament Team, NCAA Tournament MVP, All-East Regional Team, first team All-ACC Tournament, and ACC second team. 11 1990 USA Basketball Men's Goodwill Games Team. 1990-1991: All NCAA tournament team, All-Midwest regional team & MVP, ACC third team, ACC Player of the week. 12 1989 U.S. Olympic Festival participant and two time ACC Rookie of the Week. 13 He was part of an eight man developmental squad that scrimmaged against the Dream Team (featuring fellow teammate Christian Laettner) in 1992. 14 In 1992, Hurley became the seventh basketball player in Duke University's history to have his jersey number (#11) retired. 15 He won numerous awards while playing high school ball. 16 He was a point guard at St. Anthony's High School in Jersey City, New Jersey where his father coaches. 17 Has a younger sister named Melissa and a brother Danny, who played college ball for Seton Hall. 18 Played basketball at Duke University and is the school's all-time leader in assists. Had a brief NBA career with the Sacramento Kings and Vancouver Grizzlies that was cut short following a near fatal 1994 car accident.